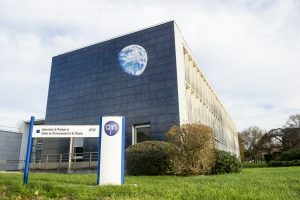 LPC2E is located on the CNRS campus, which is located in Orléans – La Source, 6 km south of the city of Orléans. The LPC2E building can be identified by the globe painted on its façade. – From Paris or Tours: take the A10 motorway, then in Orléans take the A71 motorway towards Clermont-Ferrand. Exit at tollbooth n°2 of Olivet – Orléans La Source and continue straight ahead towards La Source, to cross the N20 and a commercial zone. When, shortly after crossing the tram tracks, you arrive in front of a high school, turn left, then, at the next roundabout, turn right onto Avenue de la Recherche Scientifique. The LPC2E is then after 300 m on your left. Count 1 hour from the Saint-Arnoult tollbooth (Paris-Sud), 1 hour 15 minutes from Tours and 5 minutes from the Olivet tollbooth. – From Clermont-Ferrand: take the A71 motorway, exit at toll booth n°2 of Olivet – Orléans La Source and proceed as above. Count 3 hours from Clermont-Ferrand. – From Orléans-centre: take the N20 towards Vierzon, exit at Orléans – La Source and continue straight ahead towards La Source. After the tram tracks, proceed as above. Count 10 to 15 minutes from the centre of Orléans. In Paris, trains to Orléans leave from Austerlitz station. Get off at Les Aubrais and take the tram in the direction of Hôpital – La Source. Get off at the stop Campus – L’Indien. On leaving, cross the tracks, take the opposite passage under the vault and walk along the shops; continue straight ahead, pass under a footbridge to reach a high school. Turn left, walk along the pool and the stadium and at the next roundabout, turn right on Avenue de la Recherche Scientifique. The LPC2E is 300m further on your left. The tram journey takes about 35 minutes, the walk about 10 minutes. From terminals 1 or 2, take successively the RER B to the station of St. Michel – Notre Dame then the RER C to the station of Austerlitz. From Austerlitz station, take the train to Orléans. The journey from the airport to Austerlitz station takes about 50 minutes. By train: take the Orlybus to Pont de Rungis station, then the RER C in the direction of Versailles, to Austerlitz station. From Austerlitz station, take the train to Orléans. The journey from the airport to Austerlitz station takes about 45 minutes. By car: from Orly airport, follow the signs for Versailles and Bordeaux until you reach the A10 motorway. Then proceed as above. Count 1h20 of travel time. Take the tram A direction “Hospital”, get off at the stop “Université l’indien” then walk from Place de l’indien. Take bus 7 at the Orléans E station (Orléans) stop towards Petite Mérie (Saint-Cyr-en-Val), get off at the Théâtre Gérard Philipe stop (Orléans) then walk from Place de l’indien.